Celebrate with us 46 years of Fiesta! Our festival honors culture, tradition, and family. Mexican Fiesta encourages individuals from all ethnic backgrounds to share in the beauty of Mexico’s rich history, art, music, and food. 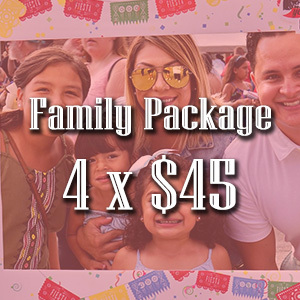 Take advantage of this GREAT promotions, and see you at Mexican Fiesta 2019! CHILDREN 8 YEARS OLD AND UNDER FREE WITH AN ADULT. PROMOTION WILL BE AVAILABLE ONLINE AT WWW.MEXICANFIESTA.ORG. PROMOTION IS SUBJECT TO CHANGE WITHOUT A PRIOR NOTICE. FOR MORE INFORMATION CONTACT THE MEXICAN FIESTA OFFICE AT 414-383-7066.